So see me with my head tie up ... ok, maybe not! ... but I'll tell you which print I own, the green and turquoise polka dots. LOL. 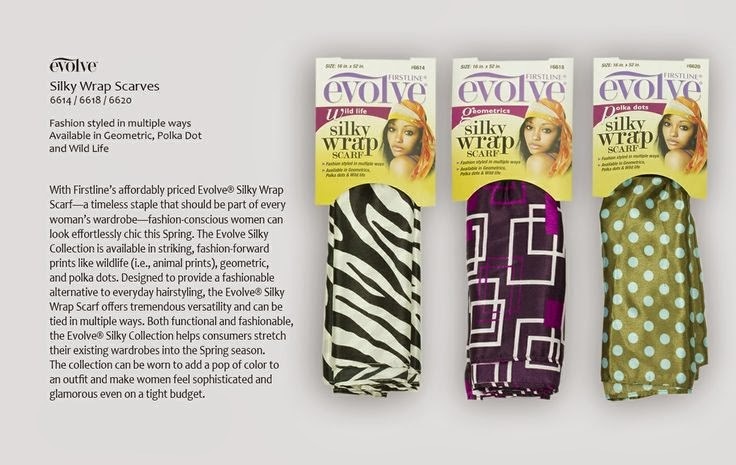 My recent hair product must-have is the Evolve Silky Wrap Scarf. The affordable scarves are affordable and available in striking prints like wildlife (animal prints), geometric, metallic, and polka dots. Designed to provide a fashionable alternative to everyday hairstyling, the Evolve® Silky Wrap Scarf offers tremendous versatility and can be tied in multiple ways. Let me pull out my measuring tape. It's 53" x 16" (inches). Even after I've wrapped my head there is enough give to tie a double knot. And though it's perfect for heading out the house, I wear mine at bed time. No longer do I wake up with a lion's mane, since I have never been a hair-rollers kind of girl. Due to the Silky Wrap, my style at night is exactly the same in the morning. It's almost unbelievable!